While dream catchers originated in the Ojibwa Nation, during the Pan-Indian Movement of the 1960s and 1970s they were adopted by Native Americans of a number of different nations. Some consider the dream catcher a symbol of unity among the various Indian Nations, and a general symbol of identification with Native American cultures. However, other Native Americans have come to see dream catchers as over-commercialized. Non-Indians have also used the dream catcher for their own purposes, sometimes New Age in nature. Traditionally, the Ojibwa construct dream catchers by tying sinew strands in a web around a small round or tear-shaped frame of willow (in a way roughly similar to their method for making snowshoe webbing). The resulting "dream-catcher", hung above the bed, is used as a charm to protect sleeping children from nightmares. As dream catchers are made of willow and sinew, they are not meant to last forever but are intended to dry out and collapse as the child enters the age of wonderment. 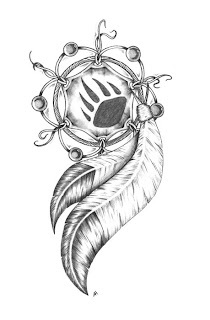 The Ojibwa believe that a dream catcher changes a person's dreams. Only good dreams would be allowed to filter through . . . Bad dreams would stay in the net, disappearing with the light of day. Good dreams would pass through and slide down the feathers to the sleeper.